As of the writing of this, we have been extremely busy getting ready for our first camp meeting. It will be from the December 9, 2011, to January 2, 2012, and we are racing to get everything ready. So far we have about 50 people that will be camping out or staying in the houses, with additional day-only guests. Our theme will be the Three Angels’ Messages. I am in charge of the children’s activities and meetings, and I have my hands full with all ages and not much material to work with. But I know the Lord will bless; He always has. It is our prayer that those who come may truly find “the power of God unto salvation” during this camp meeting. In love again: Richard and Rosa with their children. In my last mission report we asked for prayers for some of the new members of our church group. I wanted to share with you a little about Richard and Rosa, the couple who had come to us with a broken marriage, filled with bitterness and hurt, with little hope for finding happiness. They are now growing spiritually by leaps and bounds. They have fallen in love with Jesus, and He has shown them how to forgive and love each other. Their neighbors tease them about being Romeo and Juliet, because they cannot believe the change that has taken place in their home. Their little boys are growing healthfully and happily with no more constant runny noses and allergies as they are now on a vegan diet, and no more candy. Patricia is the woman who had never been taught how to pray and whose husband works in the mines far from here and comes home once in a while to drink and party and waste all their money. She was able to convince her husband to come to church one time, and although he has not come again, he has allowed her more freedom to attend church on Sabbaths. Another member, Magdalena, is still holding strong to her faith and principles, even though her husband drinks even more often now and dodges her steps. She is able to come to church every other Sabbath, and even though it means a four mile hike uphill carrying her two-year-old, she comes marching in, smiling from ear to ear just in time for Sabbath school. Praise the Lord! The Chavez family—faithful attendees that have given much despite their poverty. We also have the Chevez family with their nine children, from ages 6 to 22, who never miss a Sabbath. 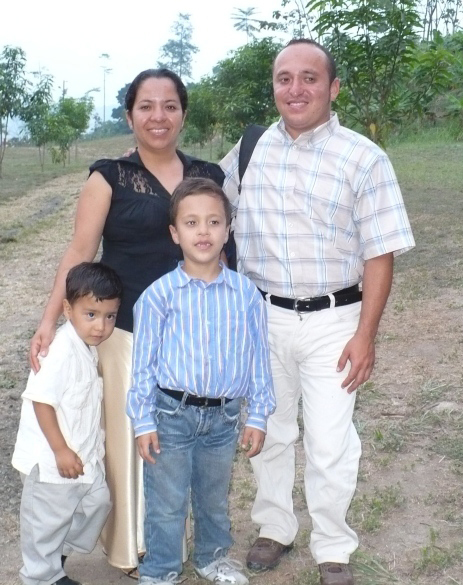 The father Alberto has always held back and resisted accepting Christ completely into his life, but we praise the Lord that these last six months he has been coming every Sabbath and is now taking a personal interest in each service. He is putting into practice in his home and at work the things that he is learning. 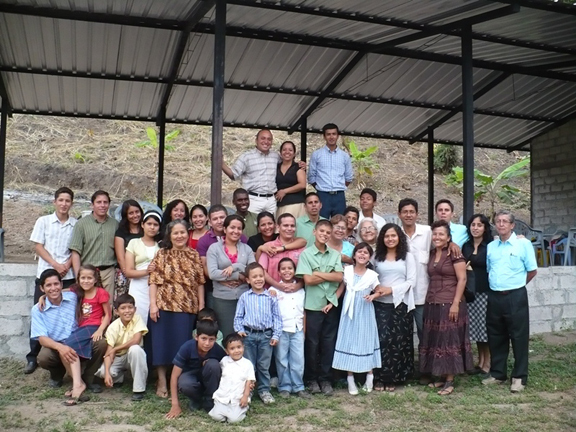 They are some of the members who have given the most towards our church project, because in their extreme poverty, (You should see where they live—the rusty tin sheets of roofing on their house barely keep the rain off of them!) they have given more than the rest. We know that the Lord will bless them for it, and He already has started to do so, especially since they have accepted and begun to faithfully tithe, although it be only a pittance. 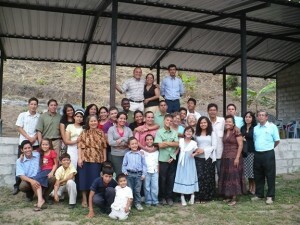 Pra del Tor church group. donations for our church and bathroom project. We know that the Lord will bless you for it. It is such a blessing for us to see the little church filling up every Sabbath with a few more new faces every time. We do have an urgent need of a place for the children’s Sabbath school. Right now we are using our old meeting place (which is our carport), but it is getting too small, and now with the rainy season that is starting, we are not protected from the rain that blows in from the sides. We are hoping to be able to build a small building that will work as two small classrooms that also can be used for our fellowship meals. May the Lord bless each one of you as we draw closer to the coming of our Lord and Savior. The work in Ecuador here at Pra del Tor is advancing with sweat and tears, but we joyfully believe that the Lord will reap a bountiful harvest. May the Lord find each one of us faithful. By Laurie Orellana, Pra del Tor Ministry, Ecuador. Email: orellanafamily@gmail.com. 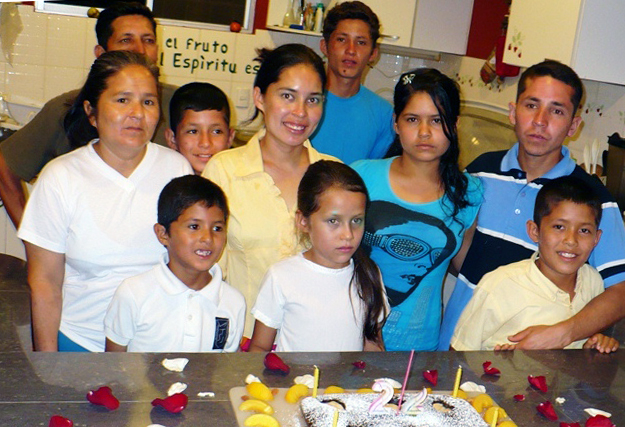 Support for their work in Ecuador can be sent through Mission Projects International, PO Box 59656, Renton, WA 98058.